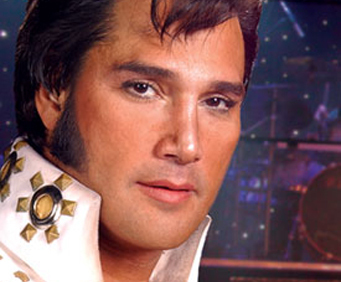 Tony Roi " The Elvis Experience"
Tony Roi began singing at a very early age, but his first experience in front of an audience was at age 8. His early bands were Rhythm and Blues, although Tony enjoys performing many different kinds of music. In the mid 80s there was a resurgence of the music from the 50s and 60s, and Tony was persuaded to do Elvis tributes based on his resemblance to Elvis. Although he occasionally would accommodate the requests, he was determined to continue performing in his own style. After months of pursuit, Tony relented. In Las Vegas, he won 'Best Singer in a Variety Show', plus three years of 'Best Act.' He continues writing and performing his own music. See schedule for show times and dates. Visitors have the option to purchase food from Andy Williams Moon River Grill. Cameras and video cameras permitted, but not during the show. Tony roi is great. I graduated high school in 1957 when the king, elvis, was the big excitement in music. Tony roi takes me back to feeling like i'm watching elvis when he played in fort wayne, indiana. I've seen a lot of impersonators but tony is the closest thing to the real elvis. I've been to two of his shows and going back for the 3rd time over the christmas holidays. He is so caring about his fans and puts on a great show every time. 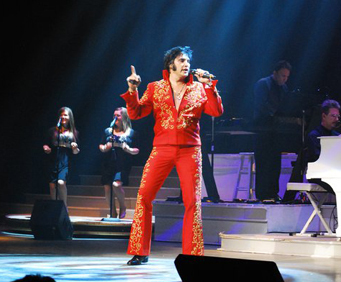 My husband and i have seen the tony roi elvis experience in branson about 90 times in the past 3 years, and saw him in andy williams' variety show last season about 8 times. We traveled to sloan, iowa to see him perform at the winnavegas casino twice, and we are anxiously waiting to see where he will go this fall and winter. Tony truly has the most amazing god given gift and shares it with the most respectful and honorable tribute to elvis presley that you will ever see or hear. 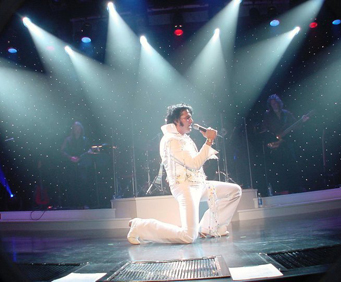 Although he has mastered and perfected his elvis experience, he is also a very talented song writer and entertainer and has recorded his own music as well. We really enjoy listening to all of his music. He is the only entertainer that allows on stage photos with him at intermission, and he takes time to meet his fans and autograph those photos after the show with a warmth and love that makes each and every one of us feel very special. We are so blessed to have found this show and met this awesome man and his precious family. We are proud to call them our friends! Great show. Very entertaining and worth the price. 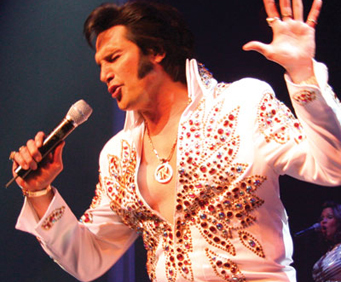 We enjoyed all of the shows we visited but two were not as long and certainly not the quality act that the elvis experience was. Great show, he sounds just like elvis and looks a lot like him. I also love how when the shows over he goes out to the lobby of the theater and talks to all of the people personally. Also, he kisses all the ladies on the cheek which is fantastic!